One of the products I get asked about more than any other is deodorant. For many people finding a natural deodorant that works well for them is a struggle. Something I always disliked about most deodorants found on supermarket shelves was the scents, they tend to be largely synthetic and not all that pleasant, so personally I find natural deodorants much more pleasant to use. 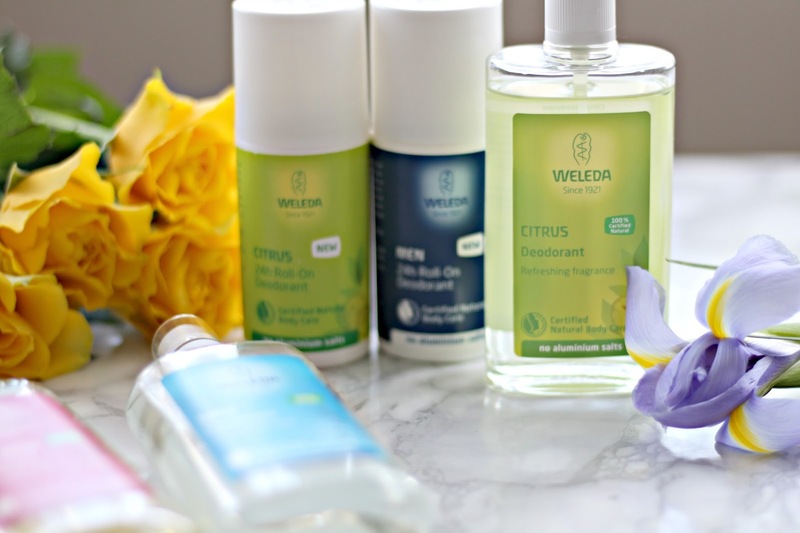 Weleda is one of my all time favourite natural brands and many of their body care products and skincare have been daily staples for a long time, but I have never given their deodorants an in depth review. Weleda have two kinds of deodorants; sprays and newly launched roll-ons. The deodorants sprays are aluminium, paraben and glycol free. They come in a large glass bottle with a small plastic lid and a pump spray. 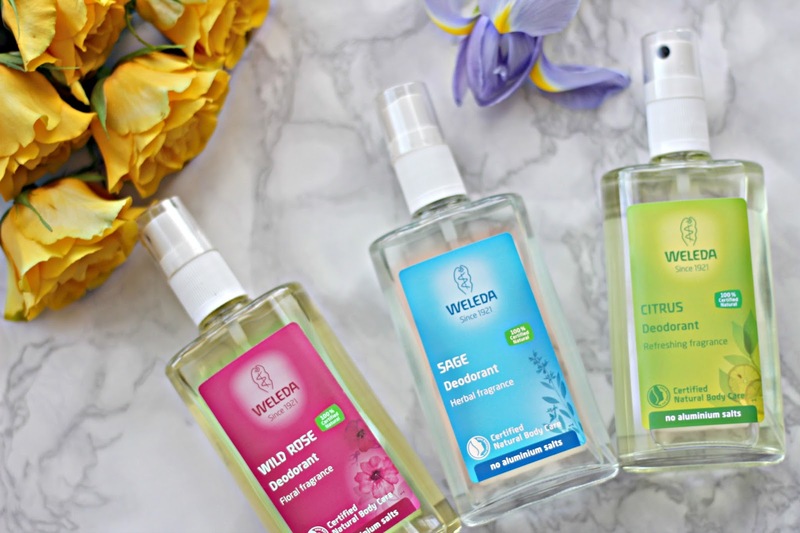 As with all Weleda products, they are beautifully scented with essential oils and I personally like to use them not just as a deodorant but also a body spray. They are perfect for carrying in your handbag to reapply during the day and the Sage and citrus scents work well for men and for women. The citrus scent is particularly versatile for the summer as we also use it as an insect repellent. The sprays have been my deodorant of choice for the last few months when I want something really quick to apply just before the school run, for me whether or not I have to reapply depends on what I am doing that day, but I find the formula generally quite impressive given they are all natural. The citrus is very fresh and easy to wear. The Sage has a more herbal note to it and rose is as you would imagine very floral. If I had to pick a favourite I would go with Rose, but they are all lovely in their own right. The roll ons are wonderfully gentle on the skin and also come in three scents. They are free from aluminium salts and bicarbonate of soda, so great for anyone who get’s easily irritated skin. Just like the sprays I sometimes will need to reapply the roll-ons during the day. You can use them as your only deodorant, or I like to combine the spray and roll-on, because the sprays are easier to reapply. I found the roll-ons dried quickly and didn’t leave any white stains behind on clothes, so big thumbs up from me for that. I have converted everyone to these deodorants in the house now, Mr Green uses the men’s roll on and shower gel. He isn’t as passionate about product as I am, so has very little to say about them, but he does make a point of asking me for more of the Weleda skincare and body care, so that in itself says something. Having a pre-teen who has just started wearing deodorant, I had no doubt that a brand I trusted, like Weleda would be perfect and so I have my eldest boy using the citrus. He likes the fresh scent and the packaging is suitably gender neutral, so he doesn’t grumble about it. My personal favourite is the pomegranate, this will come as no surprise if you read this blog on a regular basis because the pomegranate line from Weleda is one I have used for a long time. The scent is fresh like the citrus, but with a warm twist to it and I can distinguish orange and vanilla both of which I love. 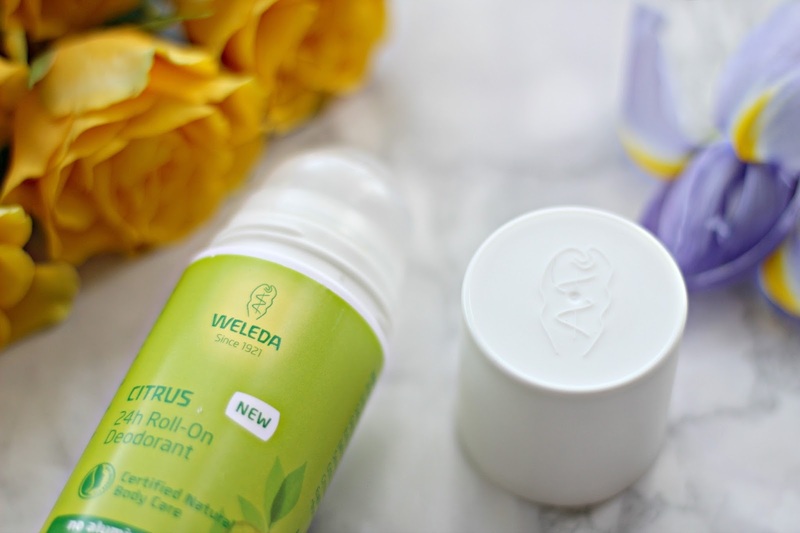 For a natural everyday deodorant I really enjoy the Weleda formulas. They are versatile and good value given the quality of the ingredients. Have you found your ideal natural deodorant match? Let me know in the comments below.